As we are sure many of you have heard, the little car company that could, Mazda, has announced their Skyactiv-X engine with the technology to run Homogeneous Charge Compression Ignition (HCCI). Two major challenges to make HCCI work: timing of the combustion and smooth transition between HCCI and regular spark ignition. The HCCI combustion process has been researched for decades, but the technology to bring an engine using HCCI to market has been elusive until now. So how did Mazda do it? We are going to take a few guesses, but as with most technologies, it didn’t happen overnight. In fact, we would say Mazda’s first big step was a few decades ago. The final piece of the puzzle is a technology Mazda has called Spark Controlled Compression Ignition (SPCCI), and we will get into how that ties into making HCCI work. We think Mazda started this whole journey in the 1990s with their Miller Cycle engine that came in the Millenia. Of course we now have Skyactiv-G (gasoline) and Skyactiv-D (diesel), which were required steps before getting to the Skyactiv-X. The new Skyactiv-X engine promises the fuel efficiency of the Skyactiv-D with the emissions and fun Zoom-Zoom DNA of the Skyactiv-G. 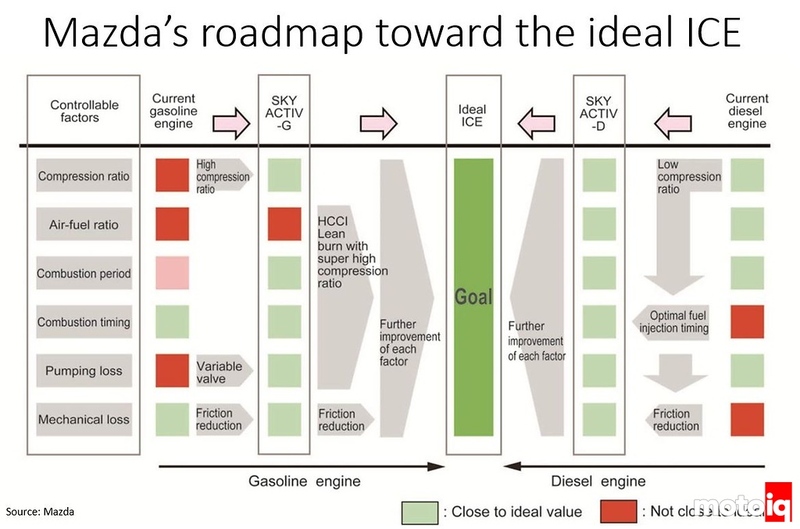 This is a tech roadmap for Mazda’s Skyactiv engine program I found, which shows how all of their engine development has been leading to the Skyactiv-X and beyond. Mazda has been systematically attacking every area of inefficiency in the internal combustion engine. Before we get into some history on Mazda’s engine development program, we need to gloss over the basics of internal combustion engines and how they get the fuel to burn. Basically every engine currently in production either runs on the Otto cycle using spark ignition or the Diesel cycle. Otto cycle engines use a spark plug to ignite the fuel whereas diesel uses the heat from compression (good ole Ideal Gas Law, chemistry class did come in handy). HCCI by definition can operate on many types of fuel, but we’re going to talk about HCCI with gasoline. HCCI also causes fuel to ignite and combust using the heat of compression, but differs from Diesel cycle due to the timing of the fuel injection. The timing of combustion in HCCI is where the major challenge lies. 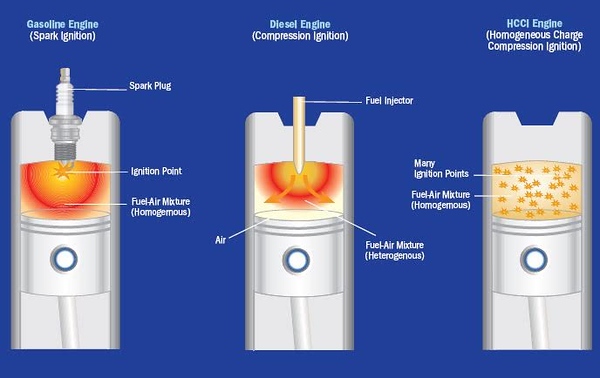 In an Otto cycle/spark ignition engine, the fuel ignites when the spark plugs is fired. All those ignition timing tables in modern car ECUs tell the spark plug when to fire relative to crank angle. Old school is the good ole distributor cap. Diesel engines ignite the fuel when the fuel is injected into the cylinder; the air is sucked into the cylinder, compressed to a very high temperature by way of the high compression ratio of diesel engines, and the fuel ignites as soon as it’s sprayed into the cylinder and comes into contact with the hot compressed air. HCCI differs from Diesel cycle in the timing of the fuel injection; fuel is mixed with the air as the air enters the cylinder like Otto cycle and then the whole air/fuel mixture is compressed until it ignites. So basically it does exactly what a standard spark ignition engine tries to avoid, igniting the air/fuel mixture by heat of compression. The challenge is controlling when that ignition happens versus crank angle. As you can see in this diagram I found online someplace, gas and diesel engines have a flame front that moves through the cylinder whereas HCCI has the mixture igniting everywhere in the cylinder. Why all the hoopla over HCCI? It should have around the same efficiency as a diesel and the low emissions of a spark ignition gasoline engine. HCCI can have similar efficiency as a diesel because they both can operate with a very lean air:fuel ratio and require high compression ratios to increase the temperature of the mixture enough to ignite. If you recall our article in compression ratio you’ll remember a higher compression ratio leads to greater thermal efficiency. A gasoline engine must run a lower compression ratio to avoid the whole compression ignition phenomenon. Diesel and HCCI engines can also run with a lean air:fuel ratio whereas a gasoline engine needs to stay around stoich to minimize emissions; the 3-way catalyst on gas cars works best when the air:fuel ratio is stoich. To maintain stoich at low loads, gasoline engines limit air sucked into the engine using the throttle plate which creates pumping losses and reduced efficiency. Running lean is great for fuel efficiency but horrible for NOx emissions in diesel and spark ignition gasoline engines.